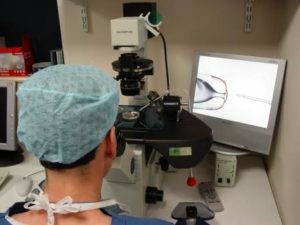 IMSI is a technique that helps IVF embryologists select the best sperm as a high proportion of sperm even in healthy men have some abnormalities. To assist this process an emerging treatment is Intra-cytoplasmic Morphologically Selected Sperm Injection (IMSI) where the sperm is viewed at very high magnification, using an inverted microscope. This enables the embryologist to look inside the head of the sperm to identify the healthiest looking sperm for injecting in to an egg using ICSI. Carl says: “I’m definitely a very proud father and love being a dad to our twins as they complete our family.”Jemma and Carl chose to be treated at Bourn Hall Clinic and selecting the best sperm with IMSI they were advised would maximise their chances of having a family and now have children Esther and Theo. “I always believed there would be light at the end of the tunnel and although sometimes it was not easy, particularly the frustration of not knowing why we had infertility issues, we kept our hope up, persevered and fulfilled out dream. Bourn Hall Clinic runs free Fertility Awareness Events throughout the year where specialists can advise on steps you can take to improve your fertility chances.